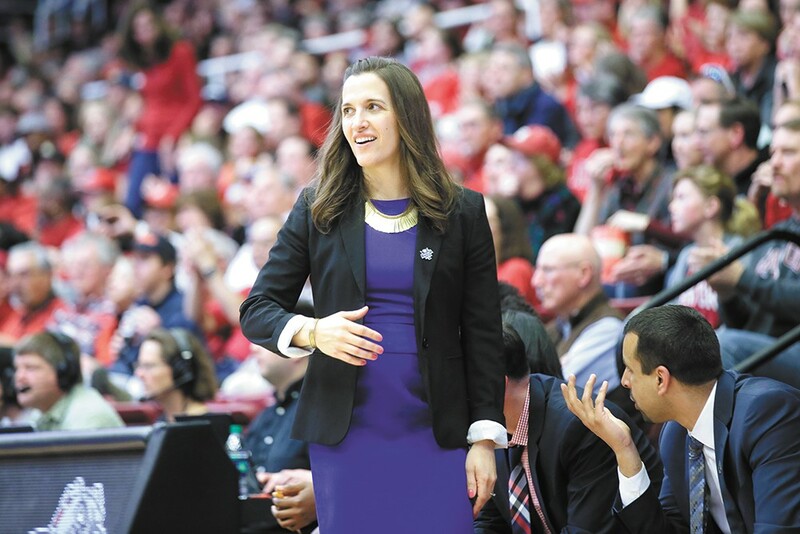 The Gonzaga women ended last year's successful season on a downer, losing in the first round of the NCAA Tournament at Stanford and being thoroughly out-hustled and outrebounded in the process. Fast forward to this season and what looked like a rebuilding year for the Zags. Jill Barta, last season's West Coast Conference player of the year, decided to forego her senior year, and their best defensive player, Emma Stach, graduated. Yes, the talented Wirth sisters (Jenn and LeeAnne) are still here as sophomores. Jessie Loera is still the quickest guard in the WCC. Jill Townsend returned after a good freshman year and transfer Katie Campbell is back, too, but hadn't shown much last year. To make things even more challenging, GU beefed up its schedule. The WCC is a liability when March rolls around. The Zags could win the conference but if they lose the conference tourney, they might still miss the NCAA tournament. So Gonzaga went out and scheduled a tough preseason, including games against the reigning NCAA champion Notre Dame and the nationally ranked and always challenging Stanford. Coach Lisa Fortier's young team breezed through their early matchups. Then came Notre Dame, and the Irish won by 16 points. Rebounding still needed serious work. A few successful weeks later No. 7-ranked Stanford came to town. Would we see the GU team that looked so bad against Stanford last March Madness, or the team that a few months previous had actually defeated the Cardinal in Palo Alto? What we got was a team better than either Zags iterations from last year. But why? First of all, Fortier and her staff had addressed the rebounding problem. And second, her younger players obviously had talent and had come a long way. Consider Katie Campbell. From an unsung player who did little last season, she'd become a star, a consummate three-point shooter, a very good defender and great foul shooter. She rains down threes, and if she has a split-second, she gets her shot off. And on defense, well, it turns out this slight drink of water can also guard and rebound. In fact, she led the team in rebounds against Stanford. The Stanford game seemed like two or three games in one. GU got off to a good start, and slowly but surely expanded its lead. Fortier's attention to rebounding was paying off, to the seeming surprise of Stanford. Stanford eventually changed up its defense and started hitting shots, but Gonzaga held them off for a 79-73 win, ultimately outrebounding the Cardinal 38-24. Fortier gave the team a "B," noting that the Zags "still have a few things to clean up." That focus on consistent excellence could mean trouble for the Zags' WCC foes. Gonzaga finished its pre-conference slate with wins against Missouri State, Washington State and Idaho. Along the way, they've gotten major contributions from the likes of Laura Stockton and Chandler Smith. Rather than focus on one or two star players, though, these Zags seem to be finding the kind of teamwide balance that can truly make them something special come March. Gonzaga's women host Saint Mary's Thursday, Jan. 3, at 6 pm, and host Pacific on Saturday, Jan. 5, at noon. The original print version of this article was headlined "Ladies (in) First"